Helping customers select the right engagement ring mounting for their diamond is a very important aspect of being a jeweler. Some mountings are simple and allow more focus on the diamond, while other mountings enhance a diamond’s size by making it look larger or of a different shape. For example, a cushion halo may surround a round brilliant cut diamond, which not only makes the center diamond appear larger, it also gives the ring a more square appearance. Whatever you are looking for in a ring, there is a mounting designed to give you the look you want! Below are some basic guidelines of mountings, which depending on your goals, you should consider for your engagement ring. A solitaire engagement ring is for the customer who wants all the focus to be on the center diamond. It is simple and comfortable. Solitaire engagement rings can be prong set with either four or six prongs, or bezel set. The bezel setting has become popular because Kelly Osborne selected that style for her engagement ring. No matter what style solitaire you choose, the focus will always be about the center diamond. In my opinion, the cut, color and clarity are very important as this is the focal point of the ring. A halo engagement ring is for the customer who wants the most sparkly and largest ring they can get. Adding pave diamonds to an engagement ring adds size as well as distracts the eye from imperfections in the diamond. The more diamonds, the more sparkle with every movement. It is much easier to go lower on clarity on a diamond that has a halo because there is so much going on. The center diamond does not need to be too large either because the mounting adds a lot of size. A three stone engagement ring is for the customer that wants to be elegant. Three stone engagement rings, in many ways, are the hardest rings to manufacture. You have to balance size, shape, color and clarity in order to give the ring a flawless effect. This ring style is for the customer that wants their ring to be unique. My favorite style engagement ring is a three stone ring because of its need for meticulous attention to detail. 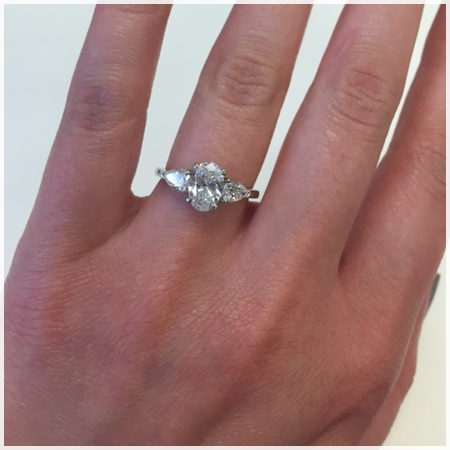 Working with a gemologist to select the right kind of engagement ring makes the shopping experience a lot easier. We can tell you what mountings are going to make your ring look larger, smaller, more rounded, or more square. We can also help you choose the right mounting for a more delicate or substantial feel. 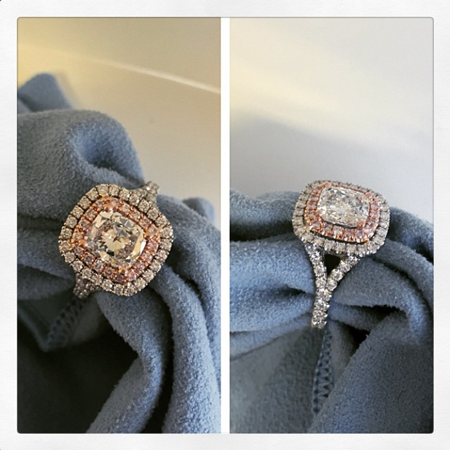 Working with a gemologist is the best way to get you one step closer to having your dream ring!